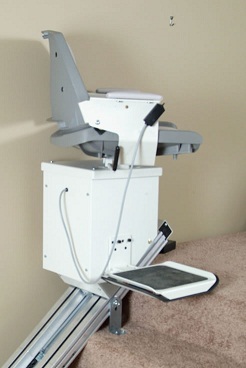 Stair lifts can be engineered in a number of different ways; most of which are equal in quality. So in most cases, worrying about the actual design of your stair lift is not all that important. All stair lift designs have been worked on for a number of years and usually have gotten rid of any drawbacks. If someone is steering you away from a particular design, it is probably because they are a salesman wanting make you buy their particular brand. We believe that there isn’t a design better than any another. They are simply just different. When using a stair lift, it is always recommended to use a seat belt no matter how safe you feel without it. All of our stair lifts come with a seat belt, because you never know when a dizzy spell may occur or any other issues that can make you unsteady. Most of our stair lifts come with folding foot rests and seats, especially because a lot of people worry about the chair taking up too much space. On average, the chair will only stick out about 14 inches from the wall; and this is only where the chair is actually located at the time. Any other part of the stairs will be completely open. In order to make the transition as easy as possible from wheelchair to stair lift, all of our lifts come with swivel seats. This makes it easy to position the chair exactly the way you need it, whether it be moving from wheelchair to lift chair or lift chair to lift chair(for those who have multi-track systems). The seat does lock into place while in use, to again, ensure maximum safety. If you’re in a house with multiple people who use a stair lift, then you might encounter the situation where the stair lift chair is at the top and you’re at the bottom(or vice versa). This problem is easily solved with the call-send control and comes standard on almost all models. You simply push the switch located at the top or bottom of the stairs and wait for the chair to arrive. The track of a stair lift has to extend past the edge of the last step or landing to almost a foot in length. Sometimes this will make it hard for doors to close. A raised mounting bracket can be installed to allow the track to be lifted up and out of the way, so that the door can close. In order to make sure that the rail does not prevent a door from opening and closing or doesn’t stick out into a walkway, hinged rails are an option. The hinged rail can fold back and out of the way. Since hinged rails are not always a necessity, they do not always come standard on our models. Every stair lift we sell comes with the basic safety feature of an emergency stop switch. They are typically located on the seat and foot rest. If a foot or anything else gets in the way of the lift’s movement, the lift will automatically stop. This significantly lowers the chance of any serious injury. To reiterate, these safety features can become disabled with incorrect battery installation, so please do not attempt to install a lift chair battery on your own or without a trained professional. Controls are mounted on the arm rest of a stair lift chair in order for the user to have complete control of their movement. Usually, they are controlled by toggle or pressure switches. Once pressure is no longer being applied to the switch, movement will stop. This ensures that you have total control over the chair at all times.